What is better to trade on the stock exchange, Forex or binary option? If it is possible to select what trading tools to use on a stock exchange, it is always difficult to make a choice for a beginner. 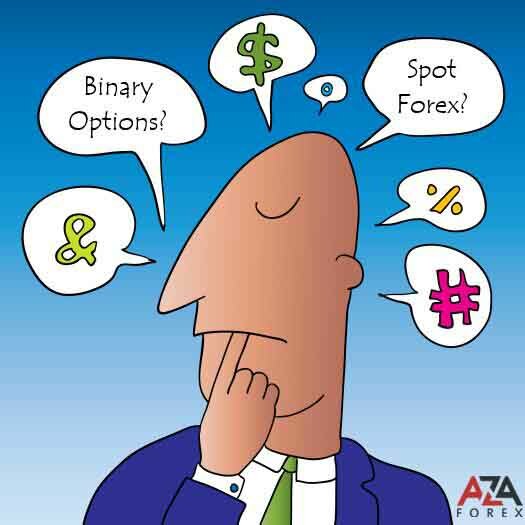 With AzaForex broker offer of 200 trading instruments you have always a broad choice. You always have access to Forex, trade in Gold, Silver, Oil, you can make transactions on the shares and Indices market, as well as to trade with Binary Options. With such a wealth of choice eyes just run away. The choice of trading instruments depends on the preferences of the client and his trading strategies. If you like a calm measured market it is possible to trade on the forex currency pair EUR USD, USD JPY or USD CHF. The movement of these currency pairs does not have strong volatility, they have low spread, perfect for scalpers and beginners. If you prefer to trade with more volatile instruments where prices are changing with greater amplitude and where you can make more money, but with a greater risk, you should like Gold, Oil, currency pair GBP JPY. These tools well react to economic news, can easily pass during one trading session 300 points or more. Gold rate is sensitive to all global trends and can change its direction of motion with ease and with the same huge amplitude. Oil depends on many economic factors, and for those who follow the commodity markets and are confident enough to predict the direction of the world trends, the oil will fit. These tools have a higher spread, but the potential profit they provide can cover all trading cost. If you like fundamental analysis and are interested in reading corporate news, global companies, follow the payment of company’s dividends, are interested in their achievements and new developments, then your choice should be to stay in the stock shares market and global indices, where you can realize your economic knowledge into practice and at the same time earn money. You can enter the medium-term positions and trade within the trading day. Sometimes shares, at the opening of trading on the New York Stock Exchange, can be opened with a gap. At the opening of a day traders should pay particular attention to the behavior of the stock. If you do not want to know all the delicacy of forex and the stock market, learn how to place different orders and calculate the amount of the position, count points, and you are looking for trade without all market fine points, or you just do not have time for this whole deal, then binary options can be an alternative. Binary options strategy is very simple. You only need to bet and guess at which side of the current option price will be in the nearest future. The prize does not depend on how many points will take the price, you guess it will be enough if it is above or below the current price of the option. Even if the price will be one point in your direction, you will always get a fixed profit and it is a huge advantage of binary options. If you compare options with forex and stocks, everything is much easier. You just choose the size of the bet, the expiry of the option, and where the price will be. No more hidden stones, only trade and pleasure of getting profit. Therefore, try to trade with different instruments, because we all have different price movement on the charts, different characters. In your investment portfolio take those that best meet your requirements on spreads, risk and profit, and enjoy the unlimited potential of the exchange market, which will make you free and rich.